ARS scientists have developed a nearly 100 percent biodegradable kitty litter made from dried distiller's grains, left over from corn-ethanol production. The idea of using corn or other grains as the basis of an environmentally sound cat litter isn't new. But the ARS research team at the agency’s National Center for Agricultural Utilization Research in Peoria, Ill., may be the first to extensively study the potential of treated, spent grains called “x-DDGs” as the primary component of a litter, and to make their results publicly available. DDGs are "dried distiller's grains." 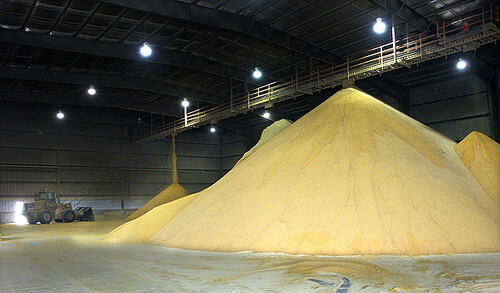 A DDGs-based litter may provide a new and perhaps higher-value market for the tons of DDGs that corn ethanol refineries now primarily market as an ingredient in cattle feed. The “x-DDGs” tested by Vaughn’s group are DDGs that, after being used for ethanol production, are treated with one or more solvents to extract any remaining, potentially useful natural compounds. The team's laboratory experiments yielded a suggested kitty litter formulation composed of the x-DDGs and three other compounds: glycerol, to prevent the litter from forming dust particles when poured or pawed; guar gum, to help the litter clump easily when wet; and a very small amount of copper sulfate, for odor control. The resulting litter is highly absorbent, forms strong clumps that don't crumble when scooped from the litter box, and provides significant odor control, according to Vaughn, who did the work with ARS chemists Mark A. Berhow and Jill K. Winkler-Moser at Peoria, and Edward Lee of Summit Seed, Inc., in Manteno, Ill. It would be great if we can see the new litter in the marketplace. Sounds like a win win situation. Hope it can be realized. We have been using corn-based kitty litter for years. As the article says, it clumps and works well and is environmentally-friendly, but our main reason for getting it is that we believe it is safer for our cats than clumping clay litter, which (anecdotally, as least) can harm cats by accumulating in their digestive tracks after they groom themselves. It's a win-win for all concerned. DDG has a value as an alternative feed source for livestock since the corn it is derived from is too expensive to be used as a supplemental feed. Yet another higher profile article to not consider the current use of the product.